On iOS and Android mobile apps, you can enable signups on an event, set a maximum number, and more. Setting a signup option for an event helps you keep track of attendees and make better plans. Hosting a workshop? It helps to know how many people will attend. Or perhaps you’re booking a training session with a small group of clients; you need to know who will be there, and prevent too many clients from showing up. With event signups, you can set a maximum number of signups to prevent overbooking. You can also set a deadline for signups. You can also choose who can see the signup list: all users, or users with modify permission. If you make the signup list visible to all users, email addresses are automatically masked to protect privacy. See more details about working with event signups on Teamup mobile apps. Once signup is enabled by the event organizer, a signup button will appear in the event viewer. Any potential participants can signup by clicking the signup button. Participants can tap the Signup button when viewing the event. To see who has signed up, tap the number to the right of the signup button to see the signup list. The event organizer can see both the name and the email address of a signup. The participants and others with read-only access to the event can only see the names of those signed up. 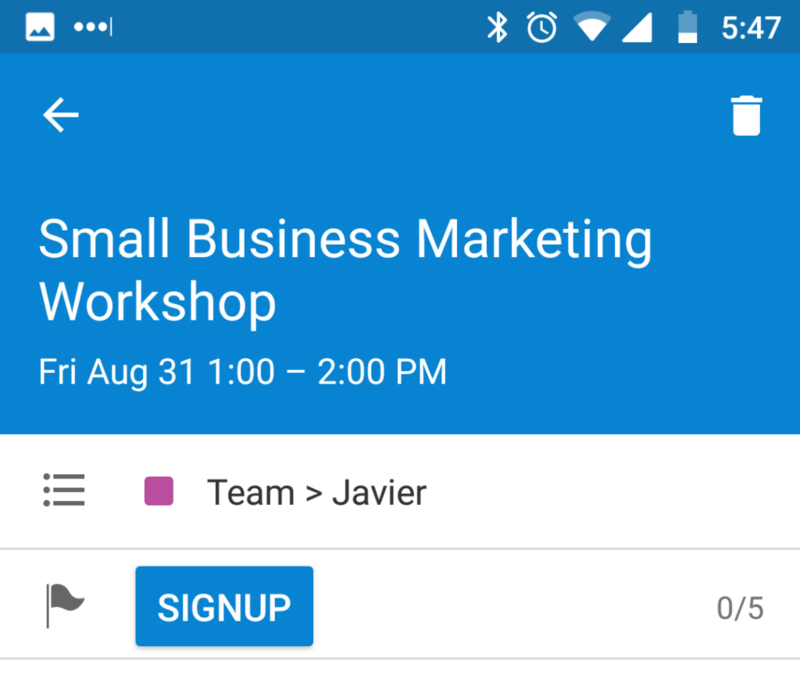 Learn all about using event signups on Teamup mobile apps. Learn more about using event signups in the web browser here. Not sure how you could use signups? Check out these ideas.